Ask fellow campers about "The Willows Campground and RV Park" and nearby attractions. Willows is now about 80+ percent seasonal. Reservations are necessary for a short-term stay so do call ahead especially considering the limited campgrounds in the Kenora area. Trees have grown very close to the roads making the "Big rig friendly" descriptor a bit misleading: large rigs will rub some branches getting in and out. The office isn't always staffed and the staffing available spends limited time in the campground so much is expected in self-regulation. (Speeds, golf cart use, fires, noise etc) The campsites are fairly large and separated by trees and bushes but the traffic and dust can be a problem. The phone service is non-existent as is the WIFI most of the time. The seasonal residents are, for the most part, very friendly and helpful. Washrooms are dated but functional. Power can fluctuate when the park is at capacity and the water is heavy with minerals so most rely on bottled water for consumption. We camped at The Willows Campground and RV Park in a Motorhome. No Frills for groceries! Canadian Tire for everything else. My choice for marine services is Woodlake Marine. HMS Kenora for evening cruise and dinner. The reception was business-like. We received no orientation, but they did lead us to our site, which was gravel and mud and not level. It was very dark at night. The stars would have been amazing, but it was cold and rainy. There are quite a few permanent residents, who occupy the better, more private and shady sites, which are mostly back-in. Short-term residents seem to be assigned pull-through sites that are closely spaced with little privacy. Late in the season there were few campers around. The toilets were dirty, and one stall (of two) was out of paper. Perhaps maintenance is better in the high season. Highway 17 (Trans-Canada) is close and loud, but not bothersome inside our closed trailer in the fall. We were here for an overnight and would do an overnight again. Wifi was good by most rv-park standards, with a simple connection: no fussy log-in procedure. We got decent reception at our site; it was a little slow at times, but quite satisfactory. We camped at The Willows Campground and RV Park in a Travel Trailer. We always enjoy coming back to Willows for the wildlife, access to Lake of the Woods and the well kept campground. About half of the park is now seasonal but the long pull thru's are ideal for short stay visitors. Several back in sites have been added since last year. During the week there are usually sites available but do call ahead for weekend reservations. Bears are regular visitors but are never a threat. Several lakes are near by so water sports are plentiful. Biking and walking are also great activities at this park. We camped at The Willows Campground and RV Park in a Motorhome. Visit Souix Narrows and the Sports center. Great information and history about Lake of the Woods. Kenora museum is very interesting as well. Rushing River Provincial Park is a favorite for families with kids. Great location as was easy off and return to the Trans-Canada. Very friendly and helpful staff. Narrow road to office circles around the rear of building for checking in. We camped at The Willows Campground and RV Park in a Travel Trailer. Fifteen minutes to Kenora's waterfront for walk friendly downtown dining and shopping.The parking lot at the Safeway grocery store has a great view of the lake. Watch for the Volkswagen Spider sculpture on the Trans-Canada Hwy on your way back to the campground as you head away from town. We called the park for reservations on the morning of our stay. The manager said they were quite full, but told us to come anyway. He said he would find a spot. And he did. He led us into a nice long pull thru with full service. They genuinely care about their customers here. Electricity 30 amps worked well the whole time. WiFi connection was good most of the time. Just a couple of times it slowed down a bit I'm sure, because so many people were on. But we never lost connectivity. Our spot was shaded, but enough open space that our satellite receiver worked well. It is 13 kilometers from Kenora, which has Walmart and plenty of other businesses. The park is in a nice setting and traffic noise from the Highway is not a problem. We enjoyed our stay here. We camped at The Willows Campground and RV Park in a Motorhome. 13 kilometers from Kenora, which has all the amenities from McDonalds to Walmart. City of 15,000. 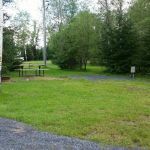 Big park w/ nice landscaping, well-maintained washers and dryers, a playground, horseshoe pits, and a patio with picnic tables. We arrived without reservations, but the owner escorted us to a long, pull-through site with full hookups and plenty of room for our slides. Electric power went off early the next morning, but was quickly restored. We were screened from the driver's side motorhome by bushes and trees, and partially screened on the passenger's side from an older travel trailer. Most of the other sites were occupied by long-term, seasonal RVers, maybe half of whom were there and all of whom seemed to know one another. These people keep coming back every year, which indicates that it is a very popular RV park with Canadians. We camped at The Willows Campground and RV Park in a Fifth Wheel. Located a few miles outside Kenora, which has a Walmart, a Canadian Tire, and lots of gas stations. It is near Longbow Lake and a few more miles from Lake of the Woods. Fishing and boating possibilities are excellent and many of the other campers had trailered boats at their sites. Very nice park and a friendly owner who was very helpful. Even delivered a box of wood($) to our site. Several seasonal RV'rs there as it's close to lots of fishing and boating. I would recommend for extended stay especially in summer months if you enjoy outdoor activities like boating or fishing. We camped at The Willows Campground and RV Park in a Motorhome. We came for a week and stayed for a month! The Willows is a beautifully laid out big rig friendly park with trees strategically placed to give each site a sense of privacy even when the park is full. All facilities are clean, well kept and convienient including washrooms, laundry facilities and office “mini store”. The campground is very close to Longbow Lake and Lake of the Woods making it a great place for access to abundant water activities. The location of the campground lends itself to hiking, biking, walking and great interaction with folk from Winnipeg and other surrounding communities who visit for the weekend or the season. Water, electric (hydro as the Canadians call it) and sewer systems all performed as expected. WIFI is weak in the very back of the park. We would recommend a good filter on the water due to a relatively high iron content. For the most important aspect of the campground a word needs to be said for the owners and staff. They and their family are professionals in the art of hospitality. They truly care about your comfort, enjoyment and overall experience of your stay. Need a rental boat? The owner will get one for you. Need firewood? It will be delivered to your site in a flash! Have an emergency and the staff will do whatever it takes to help. (This actually happened during our stay) We found this campground to be the very best of most all aspects of the RV and campground experience. We have already made our plans to return next summer for another month of their hospitality and the enjoyment of the wonderful people we met during our stay. I have never rated a park a “10” but in our book, Willows is a 10! We camped at The Willows Campground and RV Park in a Motorhome. We camped for 1 night. Site was level. Power was very good and stable. Water pressure was good. The men's bathroom was not the cleanest and definitely needs some major upkeep. The Wi-Fi would not work that afternoon or evening. It would just keep dropping out. Very frustrating! Early in the morning it worked good. I suspect that the service is too small for the people use. We camped at The Willows Campground and RV Park in a Fifth Wheel. This is a great spot. We came for a day or two while we visited the beautiful Kenora area, but decided to stay for five days. Clean, quiet, pleasant and helpfull staff, acceptable Wi-Fi and steady hydro. Easy in and out for our motorhome and toad. We now plan to come back nest year. Most of the seasonals are empty in August so that is great for privacy too. We camped at The Willows Campground and RV Park in a Motorhome. This new campground continues to be a work in progress. It consists of about 1/2 wooded sites and about 1/2 in an open area. A Wi-Fi hot spot has been added near the office, and may be accessible from the lower sites. The staff is hard at work adding new sites and improving the facilities. Restrooms are adequate and the setting is rustic. We spent 4 nights here and during two days the electric power failed several times briefly, but this issue was apparently resolved. Sites seemed reasonably level. We would definitely stay here again. Staff was very helpful and friendly. We camped at The Willows Campground and RV Park in a Fifth Wheel. 2010 is the first year that The Willows has been open, and although things are a little rough around the edges, the park is being developed very quickly. The RV and tent sites are mostly in the woods, with a few pull-throughs for overnighters. No Wi-Fi, pool or laundry yet, but the office is currently under construction, and facilities upgraded. I would definitely return! We camped at The Willows Campground and RV Park in a Travel Trailer. Are you affiliated with The Willows Campground and RV Park ?